BOOM. Yoga Revelation. And E2. I had an awesome bikram yoga class today. I was focused, working hard, and did an awesome job. And during this fantastic class, I had a moment of clarity: These NaBloPoMo posts are getting boring. So I’m ditching them. SEE YA. 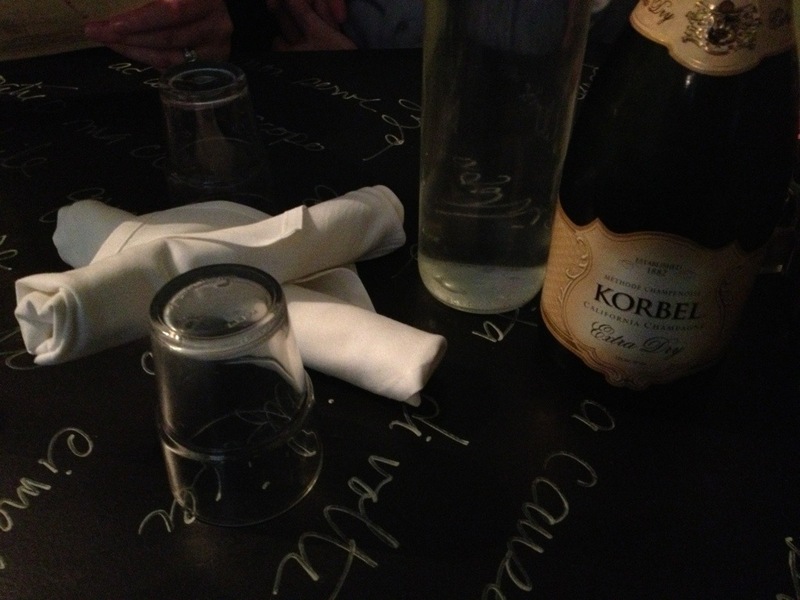 Now on to something fun– FOOD. Mr. Beez and I took our friends Christine and Trav out to E2 for a birthday brunch. I’ve been meaning to go there for ages, and was thrilled that Christine selected it. I’ve heard that the wait there can be hours long, so we went on the early side (10am). The dining room is very tiny, and can seat maybe 20-25 people. They have a nice big party room downstairs, where we sat and drank coffee while we waited for our table to open up. Even though the seating in the downstairs area are big communal tables, it would be really nice if they would open this area up for more brunch seating. E2 is BYOB. And brunch isn’t brunch without mimosas. 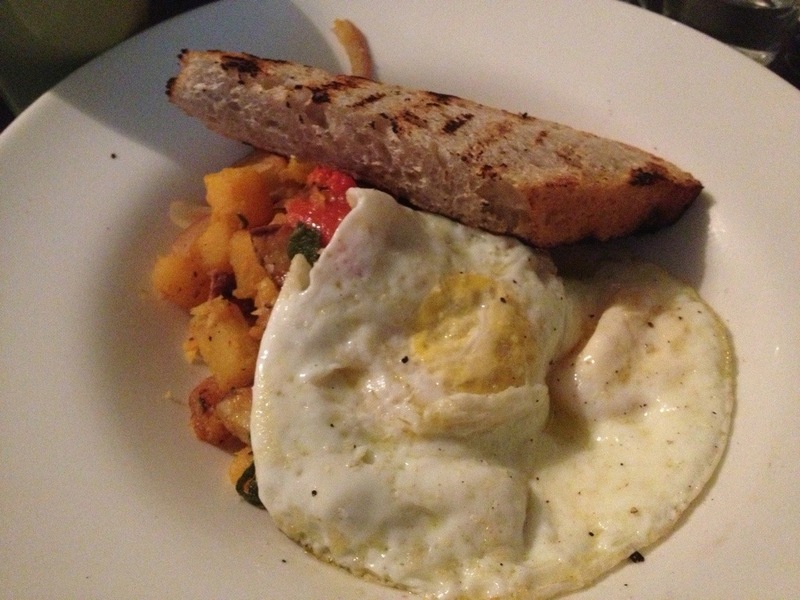 E2’s menu changes continuously, and this week’s menu was full of fresh winter vegetables and comfort foods. 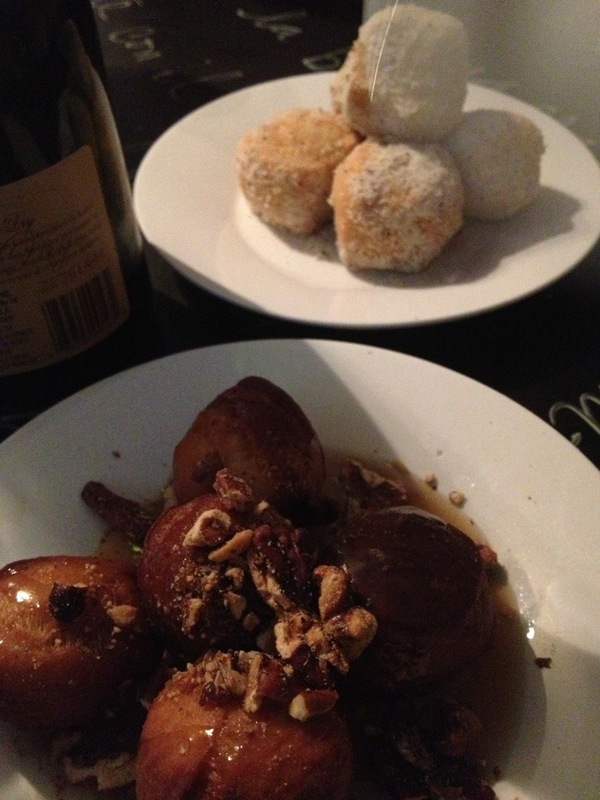 But there is also a standing menu of sweet and savory beignets. These savory zeppoli (with pepper and cheese) were my favorite part of this delicious meal, and the caramel nut beignets were a close second. 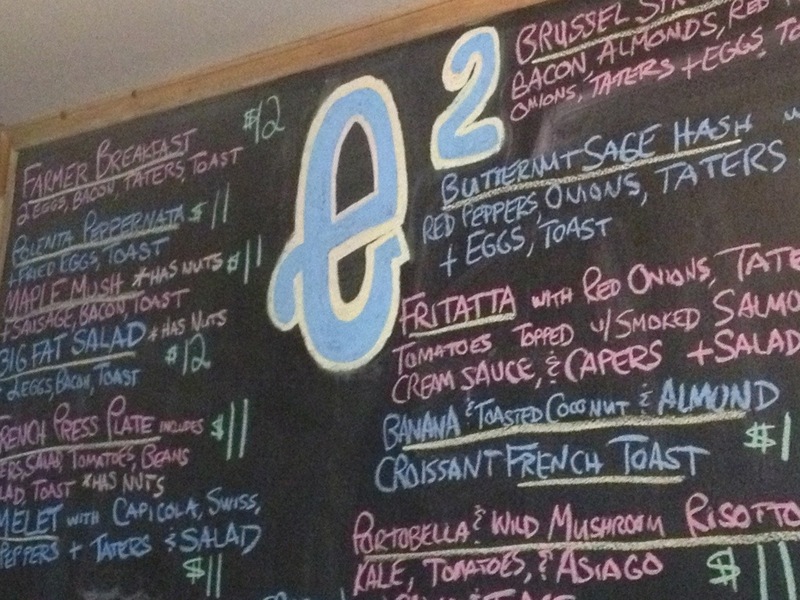 I’m not much of a doughnut fan, but E2’s fried dough made my tastebuds sing. 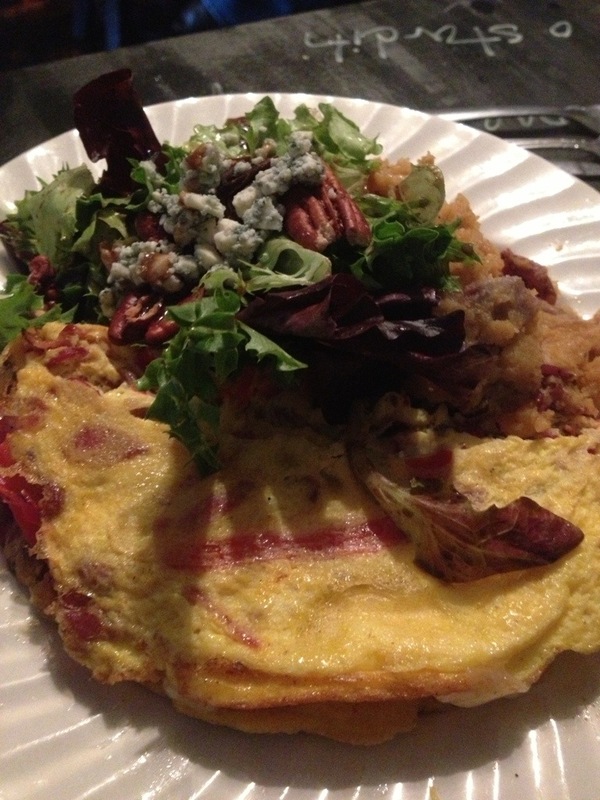 I ordered the butternut squash frittata. On the whole it was delicious, but it could have used just a little kick. I think it would have been perfect if there were some spicy sausage mixed in, or maybe I should have tried topping it with a bit of sriracha. That being said, it was still tasty, and I would not hesitate to order it again. Mr. Beez also happily devoured his omelette. Our meals were hearty and reasonably priced. I was glad that we did not get stuck with a terrible wait, and the servers were nice an attentive during our little wait. 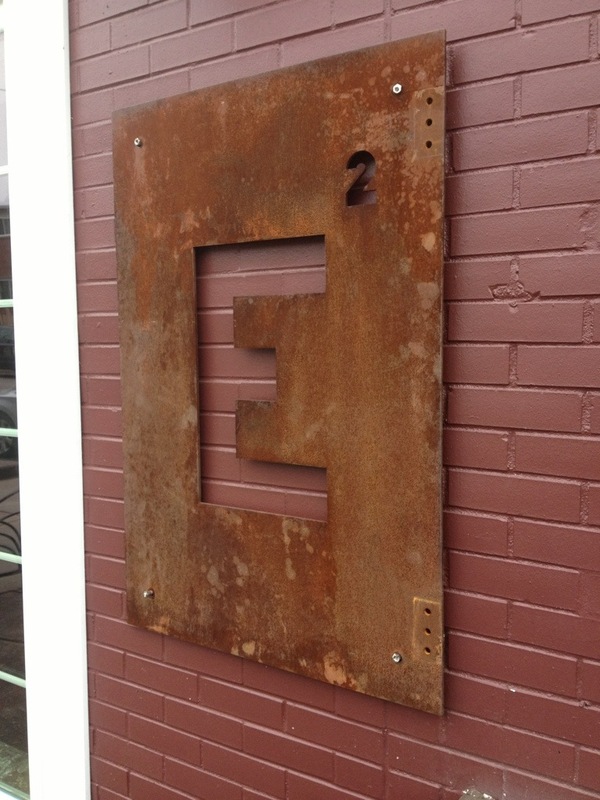 E2 is a gem in Highland Park’s cute little business district. Passive aggressive notes in MY workplace send me into fits of blind rage. I’m fortunate to work with people who are not too bad of offenders when it comes to this nonsense, but every once in a while there is a doozy. Passive aggressive notes make me nuts because they either (1) deal with some task that there already IS someone responsible for handling, they’re just not doing it, and oh by the way, the person who wrote the note usually IS the person responsible for whatever task it is, they’re just trying to shove it off onto the general office populace, or (2) deal with some issue of common courtesy, and if the target of the note doesn’t get it to begin with, the note isn’t going to get through to them anyway. On the contrary, I LOVE passive aggressive notes from other peoples workplaces. Especially ones harping on some trivial matter and are misspelled. Boy do I love the misspelled ones. So my guilty pleasure that I share with you today is PassiveAggressiveNotes.com Love it love it love it. And I hope not to see my office on there anytime soon. What is the best way to relax after a hard day? I’m easy to please. All I ask for relaxing is to just do something (or nothing) that is not work. Usually this takes the form of ordering a pizza for dinner and hanging out on the couch with my family and the TV on. Or maybe it means coffee and magazines. But it usually is just some form of me sitting around. On really bad days, I’m sitting around with a glass of wine. In an ideal world, I’d say that after a hard day, I relax by going for a run or some other athletic activity, but in all honesty after most days I’m too beat to do much else than just sit there. Since getting a Kindle, I have been reading every single night before bed. This means both that I have read nearly 40 “fun” books this year alone, but also that I manage to slow my mind down enough that I can sleep through the night. You know what’s not hard? Parenting. People say parenting is hard, but it’s not. It is very frustrating and very exhausting and full of unwinnable battles, but it is not hard. And hanging out with my kid after a hard day makes me feel a little better, because it’s pretty darn hard to truly screw up this parenting thing. NaBloPoMo Day 6: Working hard or hardly working? Although I can rattle off the number of my billable hours completed this year with precision, I find it hard to judge whether I create an impression of diligence or laziness. My work ethic is the most important career-related value to me. The biggest compliment I could receive is to be thanked for working hard. One of my biggest fears at work is that I am afraid of being perceived as lazy or not holding up my share of the work. My attention (bordering at times of paranoia) on this quality has apparently kept me focused and working hard enough that in my annual review, my highest marks were in the “work ethic” category. But high marks does not mean I can rest easy. Only because I’ve been so determined to be, and to be known as, hardworking have I established that reputation for myself. I probably work harder than lots of people, but there are also lots of people who work harder than me. Sometimes I think that I can only consider myself hardworking if I work harder than everyone else, like that I can’t think of myself as hardworking at all when there are other people who have it tougher, and are piecing together back-to-back blue collar shifts, 7 days a week, and barely making ends meet. Or that I can’t consider myself hardworking because I have managed to fit that hard work to my life, for example by leaving work at a reasonable hour but doing work once the baby is in bed, instead of staying in the office until late late at night. But being “hardworking” isn’t a contest. There is no limit on the number of people who can be “hardworking.” And just because someone’s workload is comparatively harder than someone else’s, does not mean that the person with the lesser workload is not “hardworking.” Comparing gets me nowhere. I just have to keep at it, keep my hours up, get my work done, and hope that people recognize my efforts. Do you enjoy teaching others? Talk about a time you taught someone how to do something. I learn things best when I have to explain them to someone else. Theoretically, the knowledge comes before the teaching. For me, however, teaching means I have to really think a topic through, question it, examine it through all angles, and rehash it in a concise and understandable way. I tutored other students when I was in Jr High and High School, but it has been a long time since I was in a traditional “teaching” setting. There is plenty of teaching and learning going on in my day to day work. Plenty of time is spent bouncing ideas off of other people, thinking through strategy, and exploring different arguments and approaches. The experience that sticks out most to me as a teaching experience was when I volunteered at the Boys and Girls Club when I was in High School. I was there to tutor the kids and basically hang out with them and supervise them. We got a big shipment of arts supplies in, and so I would lead them in arts & crafts activities. It wasn’t typical teaching, I wish I were crafty but I just don’t have the talent. But I hauled out the pipe cleaners and googly eyes and glue, and the kids LOVED it. There was one little girl who would follow me around nonstop every time I was there, and she would draw little pictures for me. I was just shocked at how excited these kids got about arts and crafts, and how excited they got when they saw me walking in the door. Do you feel most comfortable being a leader, a follower, or a collaborator? For me, it is completely dependent on the circumstances. If the task at hand is one that I’m familiar with, I’d prefer to lead, because I know what needs to be done and how to do it. If it is a task I am not so familiar with, or if I’m working with a group of people who like to schedule lots of meetings to talk about the things that need to be done (instead of actually doing those things), then I suppose I fall in the “follower” category, except I’d prefer to call it the “legwork” category. I am not interested in holding meetings to talk. If something is actually going to be accomplished in a meeting, that is fine, but meetings for their own sake are not my style. I’d rather everyone else sit and chat and get out of the way, while I get the work done. Admittedly, I’m not very good at being a “collaborator.” I can work fine in a team, but prefer that responsibilities are clearly deliniated, and responsibility is very clearly allocated. When I had group or team projects at school, I frequently chose to work with the kids that I knew would not contribute at all. I got a talking-to by the teachers a couple of times, because I’d do all the work and others would coast based on my efforts. To me, I so dreaded the uncertainty of unclear division of labor and having to wonder whether the others would actually do what they said they’d do, that I would rather pick a group where I had to do all the work myself because at least the division of labor would be certain. That is neither the most effective nor the most mature way to work on a “team,” but I think it serves well to illustrate how important clear deliniation of responsibilities are to me. I have a love/hate relationship with remote access to work. I love it on days like today: I had a lot of work to do, but was also down to yoga pants as the only clean clothes in my house, and it being the weekend, I wanted to see my family. If it were 10 years ago, I’d be stuck having to haul in to the office for the better part of the day (with laundry left undone, and a lonely kid). Now, thanks to good VPN access, I can throw a load of laundry in the washer, open up my laptop, and get work done as the little one dances around to the Wiggles. And working on the weekend is much more pleasant if you can work in your jammies. I don’t often work from home. One main reason is because I have to be on the phone a lot, and we have 2 parrots at home. Try to explain parrot noises on a client call. It’s not pretty. Also, I do love the structure and professionalism of an office environment. In a pinch, though, the access is priceless. Remote access is also perfect for when I need to think creatively and intensely. 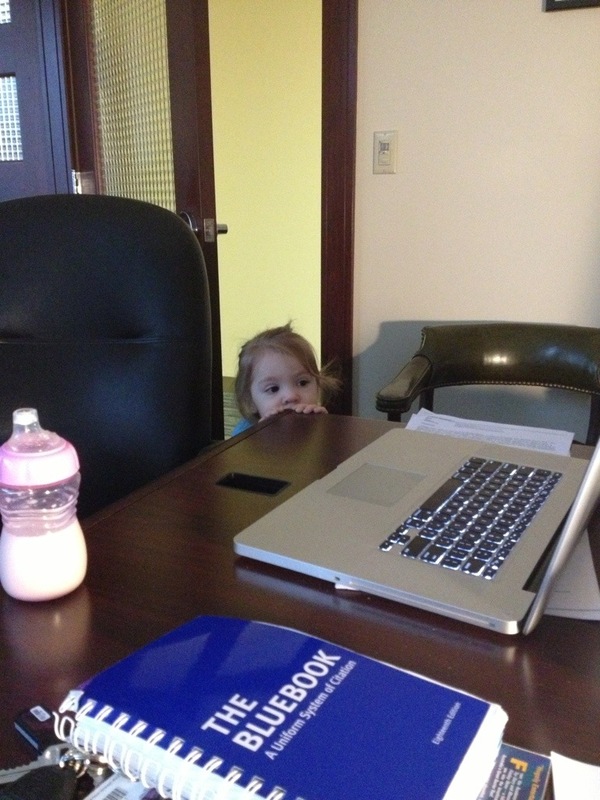 Appellate briefs in particular require uninterrupted focus. My office is not a place for uninterrupted focus. There are always people calling and stopping by. I love that with remote access I can park myself in a quiet, vacant corner of the library and get my thoughts together. The downside of remote access is that it means you can work everywhere, anywhere, all the time. Sick days become work from home days. It’s virtually impossible to have a true day away. The answer is setting personal boundaries, but that is often not a practical answer in the legal field. Courts and clients have deadlines and needs, regardless of whether you’ve got the flu. It’s nice to not have to scramble for a Plan B, but it would also be nice to actually not have to worry about working when you’re feeling under the weather. On the whole, remote access is a blessing for my family. My husband and I both work hours-intense jobs, and our ability to get the household to run and also to spend time with our daughter (admittedly sometimes multitasking, but time while on the laptop is better than no time at all), is only possible because we are able to, when the need arises, work from the couch. Does remote access give you freedom, or keep you tethered to your work? National Blog Posting Month (NaBloPoMo) started off as a response to National Novel Writing Month. BlogHer somehow positioned itself as the “official” NaBloPoMo site, and while November remains the official month, they have stretched the event over the whole year with different themes and prompts. December’s theme is Work (click for the prompts). Although work is a massive part of my in-real-life life, it takes up a disproportionally small amount of space on this blog. I love the prompts that BlogHer has posted, and am challenging myself to complete the month with their posts. There aren’t prompts assigned for the weekends, so I’ll come up with my own topics on the theme. I will also continue to add in some non-work posts from time to time. Despite the theme, writing about work of course will not involve me writing about office gossip or clients/engagements. Rather, the theme focuses on more general issues of work, motivation and discipline. -My research and briefing resulted in a positive result for an important client. The main partner on the matter sent a firm-wide email congratulating me on my hard work, and it totally made my day. -I got calls on two new engagements this week. One was specifically about a defamation case about a blogger, which is right in my niche practice area, and I’ve been working hard to develop recognition for my knowledge in this area. Building a book of business is a slow and tricky process, and I’m ecstatic to see things start moving in that direction. – Legal Intelligencer asked me to write regular Young Lawyer columns! You can look forward to see columns from me quarterly!